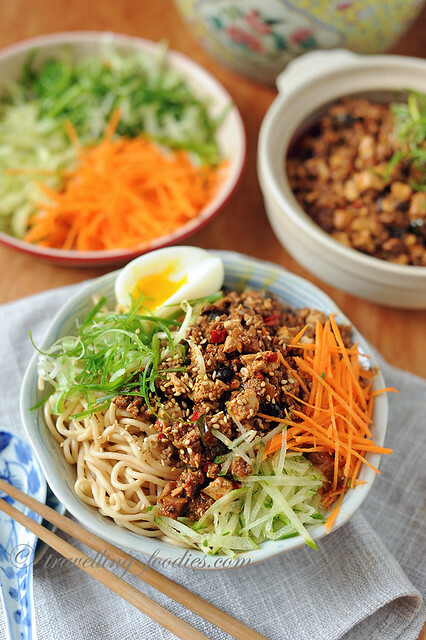 Tuesday homecooked lunch – 川味炸酱面 Szechuan style Zhajiang Mian. Many of us are accustomed to eating the 老北京炸酱面 Beijing version of Zhajiang Mian or better known as 京酱面 or even the Korean “Jajangmyeon” but not many might have tried the Szechuan version of this noodle dish which one ironically, may not be able to find in Sichuan China itself! This is only because it is an improvisation of the original form, cooked and sold by the KMT soldiers and their families from Sichuan who retreated with Chiang Kai Shek in the mass exodus from Mainland China to Taiwan in 1949.